After getting my game bento rush out of my system I decided to go back to my all time favorite theme. Totoro! I wrote in my blog before, but I think I’m best at copying things. I like figuring out how to make food into a character or how to recreate a certain scene, but I’m not good at coming up with something original. So I just started thinking about some of my favorite scenes from Totoro. When Satsuki and Mei meet Totoro at a bus stop, Totoro gives them a little “gift” which turns out to be acorns and nuts. Satsuki and Mei plant the acorns in the yard by their house, and a couple of nights later, something magical happens! Satsuki awakens in the middle of the night, and sees Totoro dancing in the yard, holding the umbrella Satsuki gave him at the bus stop. He is dancing with medium-Totoro, and mini-Totoro for the plants to sprout. Satsuki and Mei join the dance, and moments later one after another, plants start to sprout out. The plants quickly grow into a huge tree, and that’s when Totoro whips out a magic top and spins it. Totoro jumps on the top, and medium-Totoro and mini-Totoro jump on Totoro’s stomach. Totoro looks at Satsuki and Mei and grins. Then the girls also jump on Totoro’s stomach and they fly off! While they’re flying through the small town, Totoro roars, and everyone roars with him. I just love when Totoro opens his big mouth. This was the first time I made medium-Totoro. I’d never made it because medium-Totoro is blue… As I mentioned in my blog before, blue is an appetite suppressant, so I try to use blue as little as possible in my bento. But this scene couldn’t be recreated without all three Totoro! So I compromised and made him with potato salad wrapped with lettuce. I put black sesame seeds on kamaboko (fish cake), seaweed with cheese for his stomach and broccoli for his ears. I made meatballs into Makkurokurosuke by putting seaweed on kamaboko for its eyes. I carved a potato into the shape of Totoro’s magic top, and fried it. 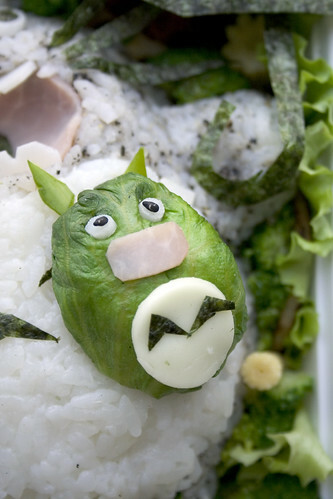 After making all the characters, I put lettuce and sauteed lotus root on top of it in a bento box, and placed Totoro on it. I pushed Totoro’s stomach in with my finger, placed mini-Totoro on it, and I put medium-Totoro on the right side of Totoro’s stomach. I put Makkurokurosuke in, and put some broccoli to fill the space in bento. I actually wanted to make small stars with cheese because this was a night scene, but I didn’t have small star shaped cookie cutter or time… So I decided to use baby corn, because it’s yellow-ish. The last piece I put it in was the umbrella… I was already running out of time, and I didn’t have any good ideas on how to make an umbrella. I could’ve bought one of those cocktail umbrella, but I really wanted my bento to be 100% edible bento. Besides, you can’t just buy one cocktail umbrella. 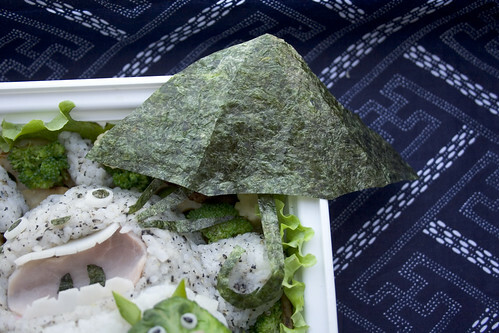 The only way I could think of was seaweed. I cut it and folded it to make an umbrella, hoping that it’d come out magically perfect! I kinda gave up on the umbrella at this point, and cut seaweed for the handle for the umbrella, which came out even lamer. T_T arrrgh! 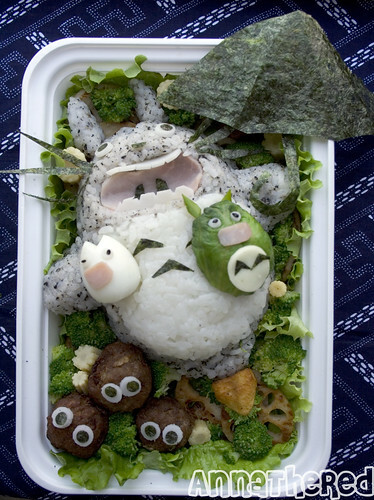 I might make flying Totoro bento again someday… I like how medium-Totoro and mini-Totoro looked with their mouths open though. Food that roars, how awesome is that? This is great. 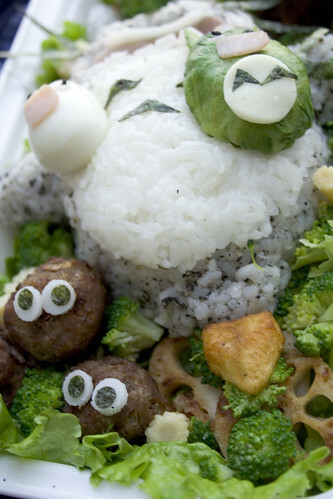 I’m going to make chibi-Totoro eggs to my son. I will admit that I have heard the word bento maybe 5 or 10 times and seen even some photos in food blogs, but I haven’t really pay attention and just clicked away. Today I ended up to this blog of yours and really! 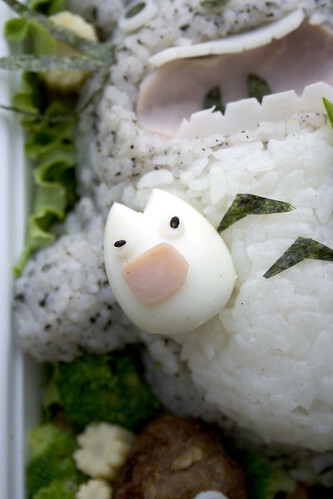 I had to do a google search for what IS bento and what is it about. I haven’t been growing in the bubble but still. Took almost 30 years before I heard Anything about this “practical food art” and now I’m all amazed by it.